Author Margaret Atwood, perhaps best known for the near-future fable The Handmaid’s Tale, has invented a device called LongPen which allows writers to sign their works at a distance, replicating their hand movements. It is the world’s first long-distance, real-time signing and handwriting device. The LongPen is known in tech circles as a ‘disruptive technology’, which means – I’m told – that it came out of nowhere, was not anticipated, is not an enhancement of a pre-existing technology, and will radically change how things are done. Author signings are just a small part of the picture! 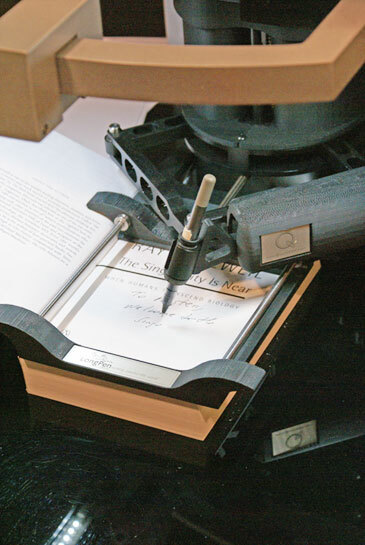 It compares interestingly to robotlab’s project The Bible Scribe, blogged here just last week. Put them together and you can shortly look forward to being the proud owner of an autograph signed remotely by your favourite robot author.